Disclosure: I am affiliated with Amazon and this post contains Amazon affiliated links. I decided to make storage containers for my laundry room (which I've slowly begun to makeover and will be a post all of it's own) and knew I had to have little labels for every box! I'm not showing you my labeled laundry containers today (I will soon) but I am showing you the other victims that got label-attacked! My daughter's toy baskets! I used an old cereal box that I had obviously used to shield something from spray paint! I traced my perfect sized circles with the bottom of a cup and ended up with 12 circles to cut! I then painted every circle (front & back) with 2 coats of craft paint. I painted strokes in every direction to end up with a textured look. I let dry 1 hour between coats. Once my paint was dried I added dots around my circles to give them a little pizzaz! I used yellow for my laundry room storage containers and pink for Lily's baskets. I had to play the waiting game again... I think next time I'll just take my blow dryer to them! After my dots dried all the way I used a Sharpie marker to write on my labels! I used twine (man, I love this stuff) to tie them unto the baskets! These labels cost me absolutely nothing to make (only patience) since I had all materials on hand! Here are more pictures of these cute little guys! Cute, easy and best of all...free! Not too bad, right? You can also check out these posts on easy upcycled items: Repurposing Cans with Rope, Mason Jar Soap Dispenser, and Pipe Strap Pulls. What easy (or free) project have you done lately? These are so cute! I can think of 100 uses for a label lie that! Very smart! I wish I had nice handwriting like you though. Thanks, Leanne!! Seriously, I want to add it to everything in our house!! Gotta love a free project! It looks great too! 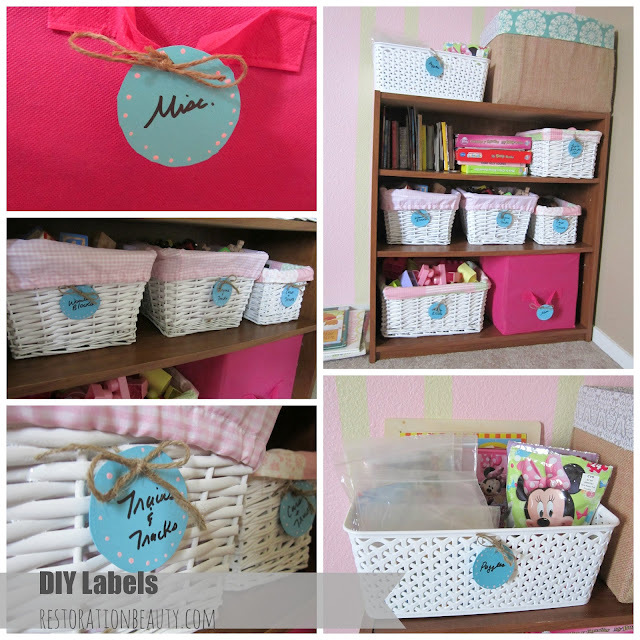 These labels are great and I love that you used a cereal box! So creative! Thanks!!! Glad you like the idea and hope you give it a try soon! The labels look great, Selene! I'm not sure how else you could cut the circles to keep a smooth edge...I'm not sure such a thing exists! Your labels are SO cute! It's amazing what just a little paint can do. Thanks for sharing. I will have to make some labels for my daughter's toys. Thank you! I know right? I really did try but ultimately decided it wasn't a huge deal! Thanks, Alexis! Those are my favorite too! You get to think outside the box! Thank you! I too, love the helping hand of paint! I hope you try them for your daughter's toys! Thank you, Kristin! It was all I could get my hands on at that moment! Simple idea! Love reusing things! Thank you for sharing at Give Me The Goods! Thanks, Amber! Love linking up!